Through consistent optimisation of the entire driveline, the MAN TGX EfficientLine 2 uses up to 6.5 % less fuel than its predecessor. With this truck, you can say goodbye to cost pressure and cut your CO2emissions. The driveline of the MAN TGX EfficientLine 2 is designed for fuel-efficient driving at very low revs. The electronic "TopTorque" torque enhancer function allows the engine's powertrain manager to make 200 Nm more torque available in the two top gears 11 and 12. On hills in particular, this boost of torque delivers more supremacy and fewer downshifts and cuts fuel consumption in the long term. The new Speed Shifting function ensures faster shifting between gears 10, 11 and 12, and the tractive power is interrupted for less time. The MAN TGX EfficientLine 2 is available in different performance levels in the 4x2 version with XLX cab and D26 engines. Whether you opt for the MAN TipMatic® 2 Fleet with fully automatic control or the the MAN TipMatic® 2 Profi, which can be operated both automatically and manually: The 12-speed shift system features an optimised gear shifting strategy to significantly reduce diesel consumption. The new Speed Shifting and Idle Speed Driving gearbox functions also promote low fuel consumption. With Speed Shifting the MAN TipMatic® 2 switches faster between the three highest gears 10, 11 and 12. This allows the gearbox to shift down faster on inclines and the tractive power is interrupted for less time. This maintains more momentum and the vehicle uses less fuel. Idle Speed Driving enables comfortable driving at idling speed. This function allows the driver to manoeuvre the truck sensitively and with great precision or to "flow" comfortably in bumper-to-bumper traffic on the motorway. After setting off, the vehicle travels at a low idling speed of around 600 rpm without the driver having to depress the accelerator. If the engine torque isn't sufficient at idling speed, the MAN TipMatic® 2 shifts down. 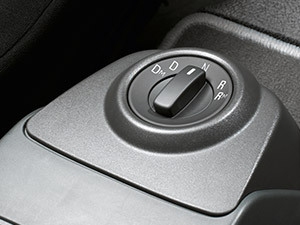 As soon as the driver depresses the brake, the clutch opens.